The next stop on our wine tour was at Roederer Estate – a winery that specializes in sparkling wines. Argyle in Oregon is the only other sparkling wine house I have visited on a wine tour, so I was particularly looking forward to this one. Roederer Estate is not family owned – it is owned by Champagne Louis Roederer, the French Champagne house that was founded in 1776. If you don’t recognize the name, you may recognize one of their most famous products – Cristal champagne. Our server was great; she was kind and friendly and explained how sparkling wines are made. She also explained some of the terminology that describes sparking wine. Brut is the driest sparkling wine, with Extra Dry being a little bit sweeter, and then Demi-Sec being sweeter still. To begin, we tasted the Brut MV (multi-vintage) which is their most mass produced wine with about 75,000 cases produced. It contains 60% Chardonnay and 40% Pinot Noir. The base vintage on this wine is 2008, and Roederer adds in 10-15% cask aged Reserve wine to give this sparkler most substance. I had never had Roederer before, and I was very impressed – it was a great wine! Next we tried the Brut Rosé MV, which was a very dry, delicate, fruity wine. I really loved this wine. After the Rosé, we tried the 2003 L’Ermitage Brut. This wine is produced with a first fermentation “enterage,” which means “on the yeast,” for six years. This wine undergoes a second fermentation in the bottle. It is very smooth and creamy, with that nice yeasty finish that good sparkling wines have. The MV Extra Dry is made with the same blend of 60% Chardonnay and 40% Pinot Noir – the difference is that after disgorging, a little more sugar is added. I was pleased with all of the sparkling wines – there wasn’t one that I didn’t want to bring home with me! Next we moved on to the still wines that Roederer produces. We started with their Rose of Pinot. Unlike most roses, this one had almost no color. It is fermented in stainless steel, with two months in oak casks – it had great acidity and a light fruit flavor. The 2009 Pinot Noir had a delicate flavor, and the fruit integrated well with minimal oak. It contrasted nicely with the 2008 Pinot Noir, which picked up a smoky flavors from the three wildfires that burned through the area in 2008. It was aged in 85% stainless steel and 15% oak. The Roederer Chardonnay has some nice tropical fruit flavors. I picked up some lychee flavors. Roederer was my absolute favorite winery of the day – I like all of their wines, and it was difficult to choose just three to bring home. By this time, we were ready for some lunch, so we got a recommendation from the server at Roederer. We headed down to Philo and got sandwiches at Lemons’ Market there. It is a small country grocery store with a deli sandwich counter in the back. I had a smoked turkey on wheat with avocado, pickles, olives and gouda cheese. Jon also had smoked turkey and gouda (we didn’t know what the other was ordering – I hope we don’t start to look alike as we to be an old married couple! ), but he had a spicy philo mustard on his. Jon also got a jar of pickled garlic to take home with us – he eats it straight from the jar! We took our sandwiches to go and had a picnic at Scharffenberger outside in their front courtyard, where we could soak up some rays. And thankfully, my stomach didn’t rebel! After chowing down our yummy sandwiches, I went into Scharffenberger Cellars to try their sparkling wines. Jon decided to stay outside with his book for this one – he wanted to enjoy the sunshine and was wined out. Scharffenberger is owned by the same company as Roederer (but was already established when it was purchased). The server at Roederer had explained that Scharffenberger produces sparkling wine in the California style, which she explained are more fruity than the French style sparkling wines that Roederer makes. I was intrigued by this, because I’ve never really done a side by side tasting (or one after another tasting as the case may have been), and I hadn’t really realized that there was a different “California” style. My server guided me through a tasting of five sparkling wines and three still wines, beginning with the 2006 Blanc de Blancs – a 100% Chardonnay sparkling wine. This wine was very dry, with yeasty bread flavors. Next up was the Brut NV (meaning no vintage), which is their biggest production wine at 25,000 cases. It is a blend of 53% Pinot Noir and 47% Chardonnay. It was quite dry with a slight citrus flavor. The Rose NV is 54% Pinot (including 4.5% with skins) and 46% Chardonnay. This sparkler was quite nice, with a pale pink color and a long fruit finish. The Extra Dry is the same blend as the Brut, but has a heavier mouthfeel and more sweetness. I finished off with the Crémant, which literally means sparkling wine that is not from Champagne. This wine is equal parts Pinot Noir and Chardonnay, and it is bottled with less pressure for a lighter effervescence. It is extra dry, but with a creamier mouthfeel and taste than the other Scharffenberger sparklers. 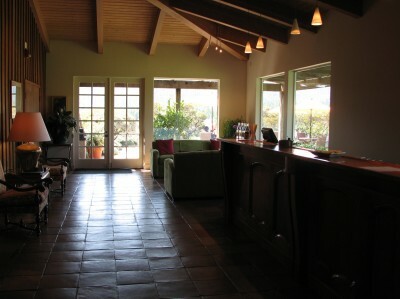 I finished off my tasting with the three still wines, which were a 2008 Chardonnay, a 2007 Pinot Noir and the 2007 Syrah. At less than 300 cases each (and only 130 for the Syrah), they aren’t the primary product for the winery, but rather a side project of the winemaker. I tried them all, but I just wasn’t satisfied with any of them. Of the three, I liked the Pinot best; it was a nice, soft light example of the varietal. 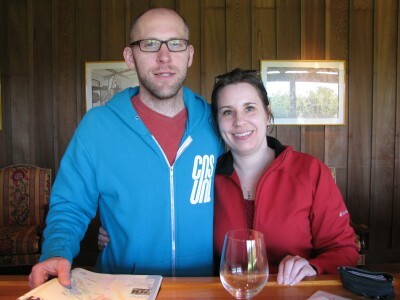 We decided that four wineries was enough for the day – I still wasn’t feeling 100% from my stomach flu the day before, and I didn’t want to push too far. I enjoyed my day, but to be honest, I wasn’t blown away with the Pinots like I wanted to be. I guess that’s a good thing, since the Willamette Valley is so much closer to home. I did absolutely love the sparkling wines at Roederer though! We headed out to our destination for the evening – Petaluma. We stopped in Healdsburg along the way to check it out, and wandered around and stretched our legs. Healdsburg is ritzy! There are lots of upscale shops – places that would certainly be luxury purchases for Jon and me. One clothing store had a clearance rack outside on the sidewalk – it was the $50 clearance rack! Healdsburg did have a beautiful square in the middle of the downtown that was very nice, and a nice local bookstore with a cooperative art gallery on the second floor. 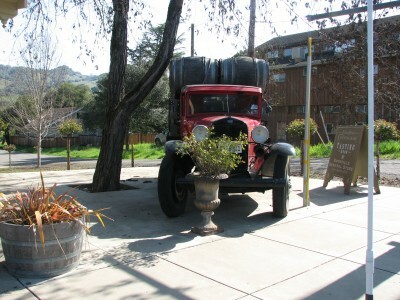 After leaving Healdsburg, we completed the drive to Petaluma, where we found our hotel. Jon went for a quick run, and then we went to go find some dinner. Jon had done a search on TripAdvisor and we found Café Zazzle, an Asian fusion style restaurant. I had the Too Much Funn – A Zazzle specialty with house made shrimp & turkey wontons & chow funn noodles – together in a chicken broth with bok choy, snow peas & sweet red peppers! I also had a delicious Pomegranate Italian Soda. Jon had the Spicy Lettuce Wrap with curry. It was so spicy that Jon even had to slow down to eat it! I didn’t try it – anything that is so spicy it makes Jon sweat would probably burn my lips off! After dinner, we stopped by a great bookstore across the street and we each found a great clearance book. Jon found an ultra-marathon book, and I found a good nerdy tourist book on San Francisco. What a great day! The next morning I woke up feeling a bit better, which was good since we only had the hotel for a night. I slept in as late as possible and then I took a nap while Jon went for a run. After he got back, I ate some bland toast and was able to keep it down, so we checked out and got on the road. We looked around historic downtown Eureka and poked around a little antique shop (sadly I didn’t find anything I had to have). We also stopped and took some photos of the Carson Mansion. The Carson Mansion was built between 1884 and 1885 for William Carson, who earned his money shipping Redwood lumber in the middle and late 1800s. The Carson Mansion has been a private club since 1950 and is not open to the public, so we were only able to take photos from the street, but it is a beautiful home! The club does have information and photos of the interior of the mansion posted here. The mansion is 3 stories (the cupola adds a fourth) and has 18 rooms. 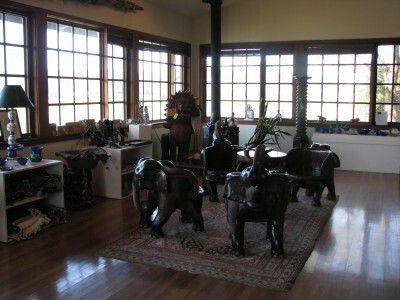 Inside, the home is exquisitely detailed with Redwood paneling, ornate wood carvings and gorgeous stained glass windows. The home was sold directly by the Carson family to the club, so the mansion has been maintained since it was built, and has never fallen into a state of disrepair like so many other fine, historic homes. 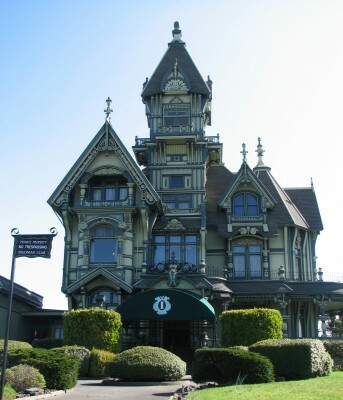 The Historic Carson Mansion – Eureka, California. Constructed 1884 – 1885. 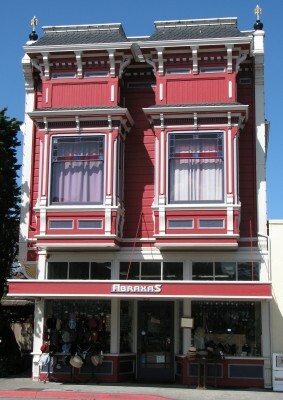 Architectural Style – A Mix of Several Victorian Styles, Including Eastlake, Italianate, Queen Anne (primary), and Stick. Our first destination after leaving Eureka was the Victorian town of Ferndale, population 1430 (have I ever mentioned that I love when cities tell you their population on the sign?). 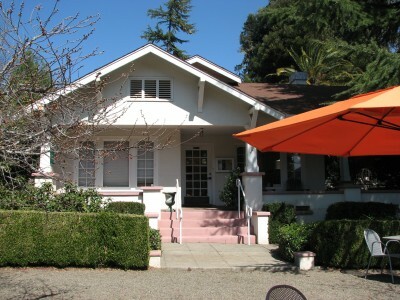 The entire town of Ferndale is listed as a California Historic Landmark (#883). We stopped at a little general store which had a neat eclectic mix of items, from modern decor and fancy food items, and several exhibits upstairs with antique items arranged in displays of rooms and shopfronts. There were displays of a millinery, a dry goods store, and an exhibit on Chinese Foot Binding. Well worth a visit. 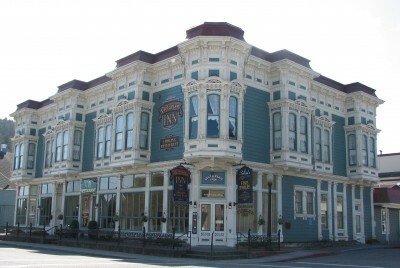 Victorian Inn – Ferndale, California. Built 1890. Constructed of California Redwoods. We wandered the main street and I took some photos of the Victorian buildings. We checked out the small grocery to see if there were any local items that intrigued us too. By this time I was feeling hungry and hoping that I could eat something. We stopped in at the Lost Coast Café and I asked the server (who was also the cook) if he had any soups that were bland, and he explained that he had a a cabbage soup in a tomato broth – normally he would serve it with a feta cheese garnishment, but I wasn’t sure that would be a great idea for my so recently traumatized stomach. The soup was delicious, even though I didn’t go for the feta topping. It was served with delicious homemade bread. I only ate half of a small cup of soup – even though I was starving I didn’t want to risk eating too much. I had a spearmint green tea, hoping to keep my stomach calm. Jon had a really good salad with caramelized onions, olives, zucchini, tomato, feta cheese, and peppers. Jon said it may have been the best salad he ever had. 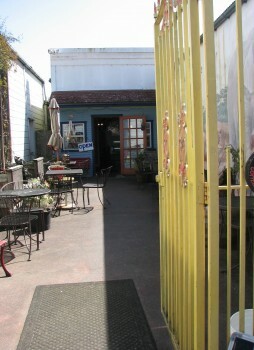 The Lost Coast Café – Ferndale, California. The Soup Was Excellent, Even Though I Couldn’t Keep it Down. Unfortunately, I didn’t keep my lunch down for long once we left the café. Sadly, I only made it about 20 paces before I puked it up on the bark mulch at the base of a tree, on the main street of historic Victorian Ferndale. A woman who was walking by watched me studying the base of the tree (I was assessing where would be my best option for lunch losing); she couldn’t figure out why I was so fascinated by that tree. She got more than she bargained for. Another of my not proud moments! 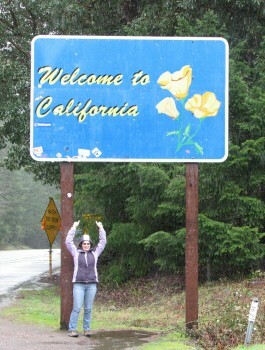 We got back on California 101, towards Ukiah. 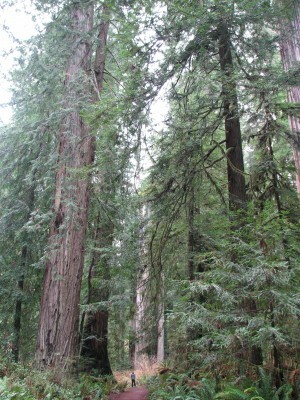 On the way, there is another worthwhile detour through the Avenue of the Giants, another huge stand of Redwood trees. The Avenue of the Giants is a 31 mile stretch of the old highway 101. 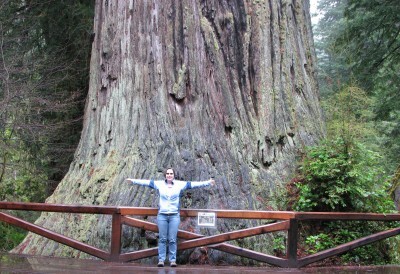 It is an opportunity to drive through stands of old and new growth Redwood trees. Avenue of the Giants claims the tallest tree in the world, at 370 feet. There are lots of places to go hiking or camping, and you drive through several tiny little towns along the way. It is a really beautiful area. Unfortunately, I wasn’t feeling well enough to go for a hike, so we settled for a few stops near the side of the road for pictures. 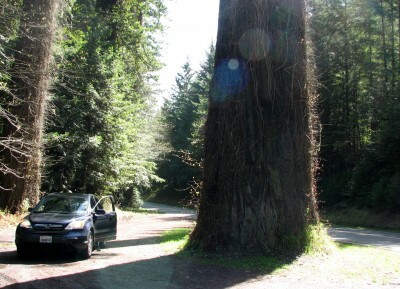 Our Honda Posing With a Redwood Tree – Avenue of the Giants. These Trees are Huge! 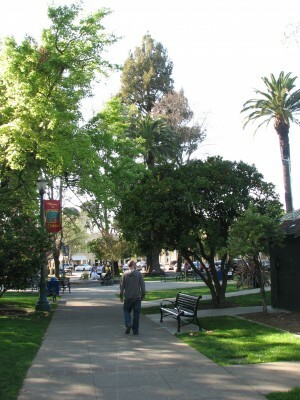 By the time we reached Ukiah, I was feeling a bit better (have you heard this story before?). We found our hotel and freshened up, and then did a bit of driving around Ukiah while it was still light out. 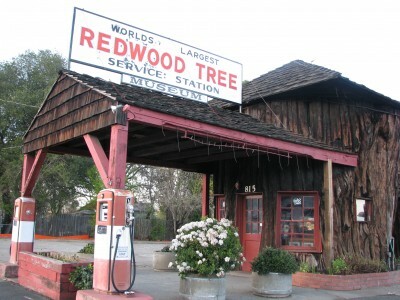 We stopped and peeked at the Redwood Tree Service Station, a little bit of Americana. 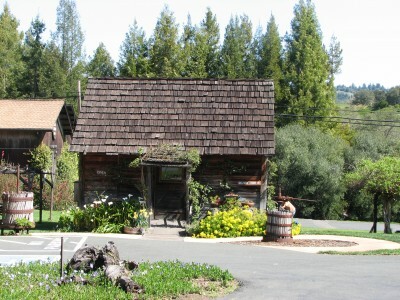 It was once a gas station, built in 1936 out of a Redwood trunk carved out inside. It is now a small museum with gas station memorabilia. It was closed when we visited, but it was neat to see the historic gas pumps out front. Cute! I tried to encourage Jon to try one of the delicious sounding restaurants that he had researched (I could just order white rice), but he didn’t want to have a fancy dinner if I wasn’t going to enjoy it too – what a sweet guy! So instead, we stopped at a Food Coop and got some things for dinner. I got some bland food – applesauce, bananas, and bread; but I was able to keep my dinner down – that was a vast improvement. Biz, my soon-to-be twenty-six year old Quarter Horse, had his dental check up last week. Biz has EOTRH, which is a degenerative disease that affects his teeth, causing them to become spongy and weakened over time. We have been watching them for a few years now, because the disease has no cure other than to pull the teeth as they become painful. As it affects the incisors, which are a horse’s tearing teeth and not their chewing teeth, a horse can function perfectly well even after the affected teeth are pulled. Two years ago he had a tooth pulled, and last year he almost lost two more. Upon the recommendation of my vet and the equine dental specialist he works with, we decided to let the teeth stay and instead we adopted a watch and wait approach. So, last week he had a new set of X-rays to see how the disease has progressed. Unfortunately, two of Biz’s teeth have further deteriorated to the point where they are almost certainly causing him pain. Like cats, horses are prey animals and they try to hide their pain if they are ill, so even though he doesn’t appear to be in pain, we have to guess that he probably is. The good news is that he is still eating well and holding weight on, and my vet shared X-rays and photos with other vets who specialize in equine dentistry and they were all impressed with his overall appearance for his age. I’m ready for spring. Apparently, Mother Nature is not. It has been cold and rainy for days – stopping only long enough to taunt us into thinking the weather might improve. As of April 11, it has already rained 1.82 inches for the month, when the average for the entire month of April is 2.59 inches. Today the sky dumped a lot more rain, but that isn’t calculated into the total until tomorrow. 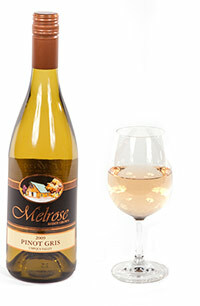 So to celebrate spring, and our commitment to keep trying new wines that we haven’t tried before, I opened a bottle of the Melrose Vineyards 2010 Pinot Gris. I purchased it on our most recent trip to Costco for $14.99. Melrose is in Roseburg, Oregon, on the banks of the South Umpqua River. 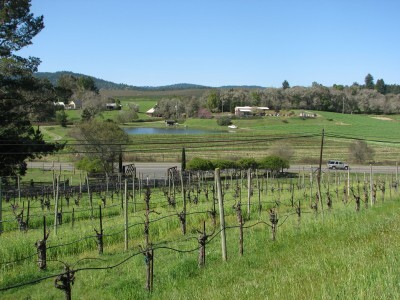 Melrose started growing grapes in 1996 for their first vintage in 1999; the winery was founded in 2000. By the photos on their website, I think I would love a visit, especially because the tasting room is located in a 100 year old barn on the property. At first taste, this wine had more than a hint of floral and light butter flavors. Which was curious because this wine was aged in 100% Stainless Steel. However, after being open for a couple of hours, those flavors had largely departed to leave a crisp Pinot Gris with apple and pear flavors. After doing a little research, I discovered that Melrose aged 33% of the grapes Sur Lie for 4 months. The lees are the dead yeast that are created by the fermentation process – to age a wine Sur Lie means that the winemaker does not filter out the lees through a process known as racking. I think that yeasty flavor was what I was picking up at the beginning. Overall, I enjoyed this wine quite a bit. With my busy week at work, I didn’t have much time at home in the evenings, so I actually had this wine for four days before Jon polished off the bottle. The wine held up very nicely until the end. My recommendation would be to let the bottle breathe for a while after opening, particularly if you like a crisper style of Pinot Gris. And if you try this wine, let me know what you think! After we left the Battery Point Lighthouse, we headed down to see some Sea Lions. We turned down Anchor Way in Crescent City, as recommended by the guide, and headed down the street a little ways to a dock right off the parking lot. This tip was fantastic! The Sea Lions were on a dock right next to the parking lot. If you wanted, you could have walked right up and pet them! That would be a really stupid move, but that’s how close they were! 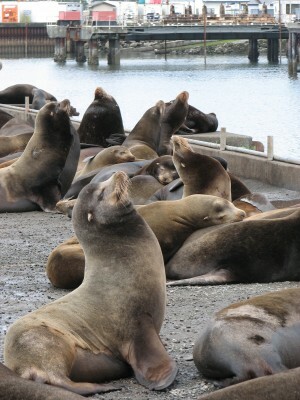 These California Sea Lions Hang Out on a Dock Right Off the Parking Lot! California Sea Lions are mammals that are found all up and down the West Coast, but it seemed like they are much more common in California. 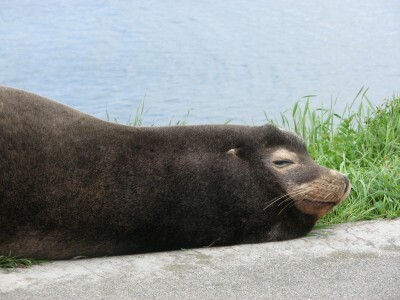 I don’t remember ever having seen a Sea Lion in Washington, although I have seen Harbor Seals. I know they can be a nuisance animal, and I’m sure the folks in Crescent City think so, but I enjoyed them. This Sea Lion is Checking Me Out Too! Then we continued down the road, stopping along the way to enjoy some of the scenic pullouts, and going to the Trees of Mystery – it is a tourist attraction where for $15 per person you can do a tour of the Redwood trees in a gondola. We opted not to. 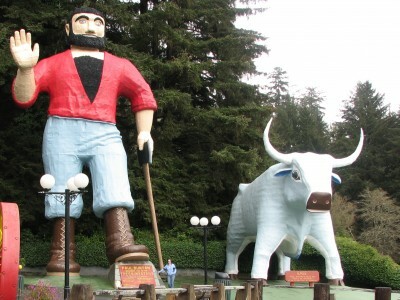 But I did get photos of Paul Bunyan and Babe the Blue Ox, who stand out front greeting visitors. In the summer months, apparently Paul talks to people – I guess there is a way to get inside and look down at the tourists. But in March, no one greeted us. Our next stop was the Klamath River Overlook – you drive way up a long winding road to an overlook that looks out over the ocean and the mouth of the Klamath River. It is beautiful and would be a great place to sit and have lunch or go for a hike. It is also supposed to be a great vantage point for the migrating grey whales. We didn’t see any though. We didn’t hang out for too long – just saw the view and continued on our way. Then we took a detour off Highway 101 to the Newton B. Drury Scenic Highway. This stretch of road is only 10 miles long, and has several scenic turnouts where you can walk among the Redwoods. We stopped at the Big Tree Wayside and took a walk in the grove. It was still drizzling, so we didn’t go for a long hike, but we did visit the Big Tree. 21.6 feet in diameter and 68 feet in circumference, the Big Tree is over 300 feet tall, and approximately 1500 years old (just so you know it is not the largest tree in the world – I think it is fourth largest). Apparently, there was a landowner in the late 1800s who wanted to cut down the Big Tree for a dance floor. And he didn’t intend to mill the wood and build a dance floor; he was going to just have people dance on the stump! I’m glad he didn’t go through with it! Of course we had to pose like ants in the forest, to show just how massive the trees are. Jon Walking Among the Redwoods. Can You See Him Down There!? After the Newton B. Drury Scenic Highway, we continued down Highway 101 towards Eureka. About a half hour outside of Eureka, I started to feel really queasy. I made Jon pull over at one point because I thought I was getting carsick from all the curves in the road. In hindsight, I wish! When we got to the hotel, I was feeling really unsettled. I got out of the car at the hotel to get checked in, and promptly threw up in their flower bed. Not my best moment! After we got checked in I continued vomiting for the rest of the night, and that’s when I realized I had the stomach flu that Jon had a couple of days before we left for the trip. UGH! Jon went out and explored Eureka a bit, and got some sickie essentials – Ginger Ale, crackers, bananas, while I laid in bed and tried to get some rest. I rushed from the bed to the bathroom all evening. Ahh… the best laid plans. At least the day’s touristing was done. The first night of our trip, we left after work for the long drive to California. We had decided to split up the drive – drive to Eugene the first night and then on to California the next day. We stopped at the Starbucks drive through on the way out of town for a snack and a pick me up – the rain was just starting as we headed out. 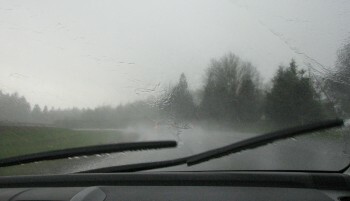 But the rain kept getting worse. Unacceptable. And there was a lot of wind. At points, you couldn’t drive the speed limit! UGH! The late start and the slow-downs from the torrential downpour meant that we didn’t get to Eugene until midnight. We were still so on edge from the rain and wind that we needed a glass of wine to settle down before bed. Covey Run Syrah. Inexpensive, nothing special, but it did the trick. As a matter of fact the wine kind of fit right in with our lodging for the night. Inexpensive, nothing special, but it did the trick. We woke up early (especially considering we were up until 1 am!) and were on the road at 8 after having the hotel’s continental breakfast. The rain continued. During the first part of our drive, we passed a lot of farms with lots of sheep and baby lambs. I have never been on that stretch of I-5 in the daylight (as an adult), so that was kind of interesting. We also saw a lot of moss hanging from bare trees. And strangely, they were doing logging right off the side of the freeway! The torrential downpour let up north of Myrtle Creek, Oregon, but not for long. We stopped in Grant’s Pass to get gas and then headed over to the Northern California Coast on Highway 199. Highway 199 is a narrow twisting road in places, but it is not scary like the Bear Camp Road we took to Gold Beach, Oregon in 2011 (never again! You can read about it here). It would be nice if Highway 199 had more scenic pullouts though, as you are traveling along the river for a good portion of it. Towards the end of 199 we drove through stands of Redwood trees. They were enormous! We learned later that those aren’t even the big ones. We got to Crescent City and had lunch at the Good Harvest Cafe. Jon had the seafood salad with shrimp and grilled fish. I had the crab quesadilla. Both were delicious and very filling. After lunch, we went to the Redwood National Park Visitor’s Center – where I got a stamp for my National Parks Passport! The ranger gave us some great information on the best scenic drives, the best hikes, and the best place to see Sea Lions nearby. He was very helpful. After leaving the Visitor’s Center we headed out to go find the Battery Point Lighthouse. 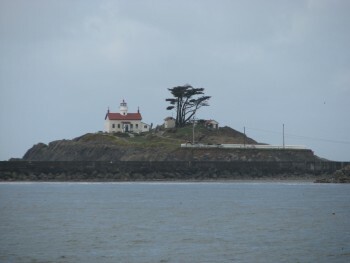 The Battery Point Lighthouse is one of the earliest lighthouses on the California coast – actually the 10th one finished. It is built in the Cape Cod style of architecture. It was first lit in 1856, with a fourth-order Fresnel lens. The light was automated in 1953. The light was decommissioned in 1965, but it was lit again in 1982 when it became a privately owned lighthouse. Fresnel lenses are smaller, compact lenses with many sections of prisms that reflect light extremely efficiently. The “order” of the lens indicates its size – Fresnel produced six sizes of Fresnel lens, with first-order being the largest. 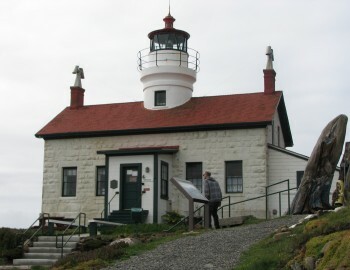 Battery Point Lighthouse is only accessible during low tide, but when the tide is low you can walk right out to it; it is open for tours on weekends from 10 am to 4 pm during the winter months. I wasn’t expecting it to be low tide, but it was! So we were able to walk across the spit and walk right up to the lighthouse. It was closed because it was a weekday, but we were still able to get some great shots of the lighthouse.